U.S. Mail Supply is your one-stop source for mailboxes of all kinds. We specialize in heavy-duty, US-made metal mailboxes for multi-unit buildings, but also have mailboxes for single family homes and small businesses. Indoor or outdoor placement, USPS approved or private use only—whatever you need, we have it. U.S. Mail Supply has a huge selection of commercial mailboxes in just about every imaginable configuration, including custom options. 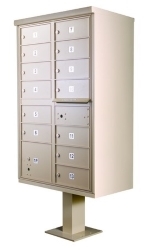 Whether you need a bank of 200 mailboxes for indoor placement or a cluster of pedestal mounted mailboxes for outdoor placement at an apartment complex, we have it. U. S. Mail Supply carries both USPS approved 4C horizontal mailboxes as well as 4C mailboxes for private use only. Both are available as wall mount or pedestal mount, and all are built with steel and heavy-gauge aluminum to withstand the wear and tear of daily use. Buying USPS approved mailboxes from U. S. Mail Supply ensures you have mailboxes that meet the strict requirements of the U. S. Postal Service. All our USPS approved mailboxes come with detailed instructions for installing them in compliance with USPS regulations. 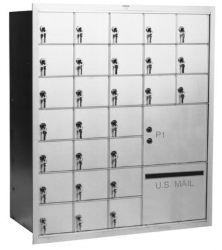 U.S. Mail Supply has everything from plain Jane, wall mount mailboxes to pedestal mounted cluster mailboxes with decorative caps and pedestals. All outdoor mailboxes are available in a range of colors to complement virtually any architectural color scheme. 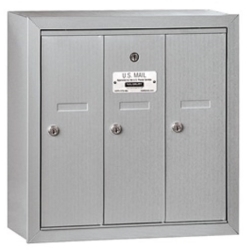 U. S. Mail Supply has a great selection of heavy-duty steel and aluminum mailboxes built to withstand the elements—including the criminal element. 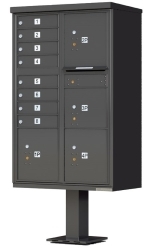 Choose from large cluster mailbox systems, pedestal mount or single-box models for small businesses. 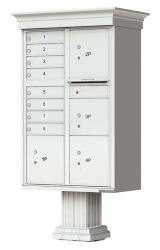 U.S. Mail Supply has a mailbox solution for any mailroom. In addition to standard horizontal and vertical mailbox configurations, we also offer custom options like front or rear loading boxes, larger compartments for USPS packages, and more. Whether you’re looking for traditional post mounted mailboxes or wall mounted mailboxes, U.S. Mail Supply has them. 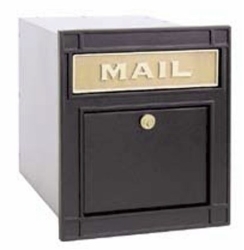 We don’t carry any plastic mailboxes, only heavy-duty, American made steel and aluminum mailboxes built to last. 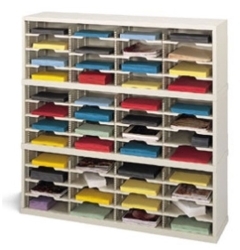 U.S. Mail Supply has a great selection of both open and closed back mail sorters to help minimize chaos in the mailroom, classroom or office. Check out our inventory and get organized. A mailbox isn’t something you should have to replace every few years. Which is why we only carry quality, US-made mailboxes built from heavy gauge steel and aluminum. They’re made to withstand the worst nature can throw at them, as well as the inevitable slams and bangs of daily use. Yes, you can find cheaper mailboxes, but they’ll end up costing you much more when you have to replace them. 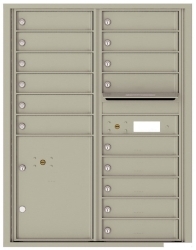 To simplify getting the right mailbox configuration, U.S. Mail Supply offers design assistance. Just select the option below that best describes the type of horizontal mail boxes you’re looking for and enter your responses to the questions. After submitting your responses, our design staff will create a rendering of how your mailboxes will look and provide you a quote.